Species Profile: The Oceanic Whitetip Shark - We Love Sharks! Species Profile: The Oceanic Whitetip Shark - We Love Sharks! The Oceanic Whitetip Shark is a slow-moving but very persistent ship-following fish. The Oceanic Whitetip Shark is one fish that likely needs very little introduction among ocean goers. It’s a large, pelagic, requiem shark that dwells in tropical and warm temperate waters. This shark gets its common name from its white-tipped and long rounded fins. In fact, those fins are the most distinguishing feature of its large and stocky body. Compared to its body, it’s fins are relatively larger than most other shark species. This makes it highly valued and a main ingredient in shark fin soup. It has a slightly “humpbacked” appearance, a broad rounded nose and eyes with nictating membrane. The Oceanic whitetip is known to be an aggressive and persistent but slow-moving fish. They dominate feeding frenzies and they are implicated in a number of human fatalities involving shipwreck and air crash survivors. This species is well-known for following ships earning them the name “sea dogs” in past centuries. Especially during the height of commercial whaling, they were responsible for scavenging whale carcass before the whalers could get to them. The IUCN lists it as Vulnerable. About 12 years for males and 16 years for females of the species. The largest specimen recorded measured 4 meters (13 feet). A more normal length for an adult Oceanic whitetip shark would be about 3 meters (9.8 feet). The maximum reported weight for an individual is 170 kg (370 lbs). Also, females are typically larger than the males. 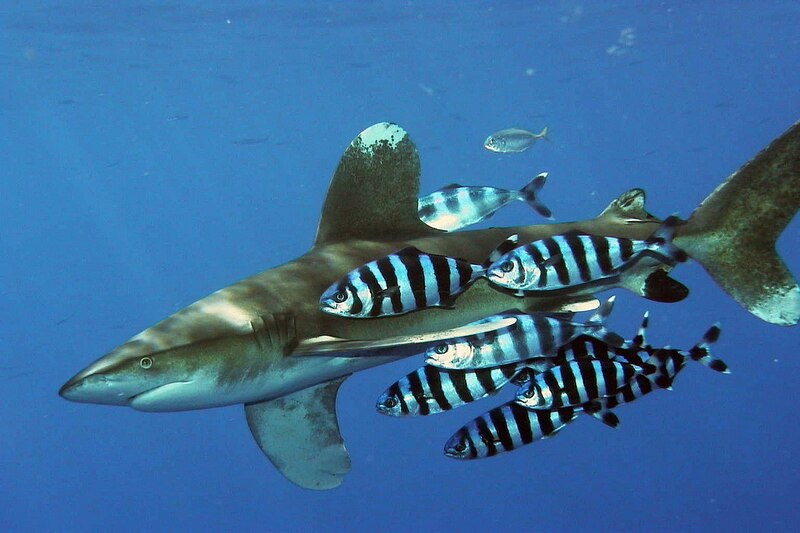 Though Oceanic whitetips are not fast swimmers, they are capable of surprising bursts of speed in the presence of food. This shark has exceptionally large fins for its size. It’s therefore a major target for shark fin soup. It is also fished heavily for its meat and liver oil. Its flesh is sold fresh, smoked, dried, and salted: its skin is treasured for leather products. Even when fisheries don’t target this species directly, its tendency to go after any bait it finds means it’s regularly taken as bycatch. They also fare much better in captivity than other open ocean sharks. Compared to other sharks, famous oceanographic researcher Jacques Cousteau referred to it as “the most dangerous of all sharks.” In fact, many experts believe this particular shark is responsible for many more incidents with humans in the open water than say the great white, for instance. That’s because of its fearless and bold tendency to go after human survivors of shipwrecks or downed aircraft. Of particular reference is the case of the torpedoed USS Indianapolis on 30 July 1945. Another incident was the Nova Scotia during World War II. This was a steamship carrying about 1,000 passengers sailing near South Africa before it was sunk by a German submarine. Only 192 people survived and the whitetip was blamed for many of the deaths. Despite that, some incidents that occurred closer to shore were attributed to people feeding the sharks. An example is the incident at the Red Sea near Sharm El Sheikh, Egypt, in 2010. One person died and others were seriously bitten by a particular whitetip that was accustomed to being hand-fed by tourists. Admittedly, the Oceanic whitetip is implicated in the highest number of attacks on humans in the open ocean. However, incidents closer to shore are mainly attributed to the sharks getting accustomed to humans hand-feeding them. Mating season varies depending on location: early summer in the northwest Atlantic Ocean/Indian Ocean, but much longer among the Pacific population. This species is viviparous: embryos develop and are fed through a placental sac in the uterus. Gestation period is one year and litter size varies from one to 15 pups. These sharks are particularly persistent and aggressive when they sense a food source. They don’t particularly discriminate in their diet. Though they mostly go after pelagic cephalopods, bony fish, threadfins, stingrays, birds, barracuda, and sea turtles. Oceanic whitetips will also scavenge on mammal carcasses. They are the most common of all ship-following sharks, exhibiting almost “dog-like” Behavior. Once they are interested in a perceived food source, they won’t back down. Because of this persistence, Oceanic whitetips often fight with other shark species and act very aggressive to them when contending for prey. Especially the silky shark. As a result of their competitive nature, they will converge in large numbers on a food source to get a bite. For this reason, this shark is known as the leader in feeding frenzies. The author of Jaws, Peter Benchley, at one time observed members of this species swimming among pilot whales and eating up their faeces. Though this shark was once described as “perhaps the most abundant large animal on the face of the earth,” by 2000 their population in the Northwest and western Central Atlantic had dropped by 70 percent. In the Gulf of Mexico, their number dropped by about 99 percent in the same period. Based on these findings, the IUCN had to downgrade it from Near Threatened to Vulnerable globally. Although its also listed as Critically Endangered in the Northwest and Western Central Atlantic areas. More recent estimates shows that their numbers are still declining rapidly. Part of its scientific name comes from its large fins. Longimanus means long hands in Latin. Also, this shark has so many common names because of its wide distribution. Their closest relatives are the spinner shark, bull sharks, the bronze whaler, dusky shark, the silky shark and tiger sharks. Once very common and widely distributed globally, it has declined sharply in recent years. For now, the Oceanic whitetip still survives in deep, open waters. They still exist from Maine, USA to Argentina and other parts of the Western Atlantic Ocean such as the Caribbean and Gulf of Mexico. In the eastern Atlantic, they swim around Portugal on to the Gulf of Guinea. There are other sightings in the Mediterranean Sea, the Indo-Pacific, East Africa all the way to other parts of the globe like the Galapagos Islands. This shark is typically solitary but they frequently gather for feeding frenzies. You’ll usually see them accompanied by, pilot fish, dolphinfish, and remora. Unfortunately, the Oceanic whitetip shark is now rapidly disappearing from the oceans and seas.